Jessica and Bobby Knudsen, parents of 3 growing boys, are the proud owners of JK Custom Communications located on the south side of Town Square in Paola (23 West Wea). Jessica, Bobby and their three boys moved to Paola in 2012 shortly after they separated from the United States Army. Bobby served our Country for just over 7 years that included multiple tours in Iraq and Afghanistan. Those 7 years taught their family a lot about adapting and overcoming not only everyday problems, but also those concerns that a family faces when dealing with a loved one in combat. It was at this time that Jessica founded JK Custom Communication to help ease her worries about Bobby. Jessica, a talented graphic designer, spent her time (in addition to taking care of their boys) working with clients to bring their ideas from mere thoughts to bold realities. With graphic design being her passion, she gave (and continues to give) 110% on every project, be it a full business setup package (log, website, social media accounts, etc.) to a single invitation or get-well card. She did all of this at a time when our Country not only called upon her husband, but also during “The Great Recession” and through their struggles, both home and away, it paid off. 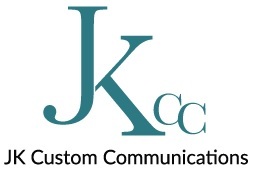 JK Custom Communication now offers a variety of services to assist you as a business owner and/or professional to include: graphic and web design, a variety of printing (including business cards and flyers), UPS shipping and office space to rent. They also offer “Quick Desks” which you can rent by the hour, or pay a monthly membership, allowing you access to a desk during business hours (up to a certain number of hours per month). And soon, they will have a conference room for public use that will include an LED TV, a marker board and plenty of room for you to hold a business meeting, a counseling session or even a class! This is also something that can be rented by the hour, day or week. It is their goal to create an environment where business owners, professionals and those preparing to be, have a place to come to do business and quite possibly an opportunity to advise or mentor someone. They realize that building any business is not easy. They also realize that it’s not cheap, and in most cases not glamorous - but their thought is, what if we did it together? Not just to boost their business, but for the surrounding communities as well. With their experience in management, graphic design and marketing, they aim to provide small businesses, and those alike the opportunity to network and learn from the failures, successes and experiences that almost every business owner has faced at some point. They are honored to be a part of this diverse community and want nothing more than to help foster the growth of individuals and businesses by offering everything needed to help fulfill the dreams of success. The Knudsen Family hopes to do business with all of you soon. Should you have any questions, or are curious about what they have to offer, please feel free to visit their website at www.jkccprints.com, or their Facebook page. You are of course more than welcome to call them at (913) 594-7055 or to email them at info@jkccprints.com You may also e-mail Jessica personally at jessica@jkccprints.com. They look forward to doing business together. JK Custom Communications will be hosting a coffee at 10:00 a.m. on Thursday, October 18th at the Osawatomie City Hall Board Room (439 Main Street). Please welcome them to our business community by attending this coffee. This is a great way to get to know Bobby and Jessica and a great way to visit with other businesses! Your support for their business is greatly appreciated!